It’s Friday night. Bright lights, pop music and dressed-up college students fill the room, but this isn’t a part of Boston’s vibrant nightlife. It’s “X Boston,” Boston’s biggest student leadership event. 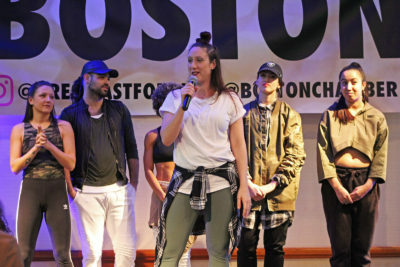 Held at Seaport World Trade Center, “X Boston” was organized by Fast Forward, an organization created to help students “start their hustle,” in collaboration with the Greater Boston Chamber of Commerce, MassChallenge and CampusTap. Students started the night in the “experience room,” where they talked with young professionals from companies like Google and PricewaterhouseCoopers, while mingling with other Boston students. “[I came] to see what Boston has to offer,” Tyler Dahm, a freshman at Suffolk University, said. Later, attendees entered the ballroom for the main event. Vincent King, a Boston-based singer-songwriter, performed and added background music to the event. Then, Pichon Duplan and Tucker Matheson, both Fast Forward co-founders, and Justin Kang, vice president of economic growth for Greater Boston Chamber of Commerce, welcomed students to the event on stage after King performed. Turahn Dorsey, Boston’s chief of education, said the city is not only a great place for students to learn, it’s also a great place for them to stay and work after they graduate from their respective colleges. The night continued with X Talks, which are speeches modeled after TED Talks, on the importance of talking about money despite its tabooed stigma and the best ways to showcase yourself in entrepreneurship. Static Noyze, a local dance troupe who were finalists on MTV’s “America’s Best Dance Crew,” took the stage shortly after. They taught the crowd an easy to learn dance step before their performance. Rhett Price, local musician and YouTube sensation who plays pop music on his violin, closed out the night. If “X Boston” sounds more like a concert than a networking event, Duplan said, he and Matheson’s planning has succeeded. “We’re trying to make the career process fun again,” Matheson said. Duplan and Matheson created Fast Forward to “help young leaders plug into global trends, explore different industries and careers, and connect with other leaders,” according to their company’s website. More than four of five college seniors graduate without jobs lined up, according to a poll conducted by AfterCollege, a networking site for college graduates. Seeing that statistic, Duplan and Matheson said they decided to create “X Boston,” hoping to change that reality for students everywhere, starting in the city where they went to school: Boston. “Our ultimate goal is to start students accelerating their careers, and I think we did that today,” Duplan said. Duplan and Matheson said they hope to hold an even bigger event next year, reaching out to even more students and connecting them with even more companies. This year’s attendees went home with a copy of Duplan and Matheson’s book “Fast Forward: What is Your College Degree Worth?” which offers students advice on maximizing their time and investment in college. The event’s success, Duplan said, only motivates him to expand it further. Eventually, Matheson said, they hope to expand “X Boston” to include all of Boston’s major universities and more students. “We want to get ‘X Boston’ to a solid foundation where we can 500 students from all the big schools in Boston and have it biannual,” Matheson said. Casey Yee, a senior at Suffolk University, said hearing it’s OK to be unsure about employment after college was reassuring. “Because I’m graduating, it’s nice to know that, even if you don’t know what you want to do, it’ll be OK,” Yee said. Great Event and a great niche idea to fill the void between college graduates and their careers! Tucker & Pichon are on to something here….keep up the good work.